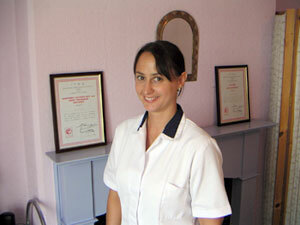 Tina specialises in Aromatherapy & Reflexology and Swedish Massage. She has a passion for complementary medicine & therapies and has studied many different approaches to healing. Tina studied at a private college in Sherwood Nottingham and qualified as a masseuse, aromatherapist and reflexologist in 1994. Shortly after qualifying she joined the Maple House Clinic team and has enjoyed working here ever since. She takes a very broad interest in complementary medicine, and has studied around her specialities in quite some depth. She has trained in Reiki to level two, and she is currently studying Hopi Ear Candle treatments. She feels that this rounded approach to complementary medicine helps her as she can offer a much more balanced approach to complementary treatment.